As Russia and the United States bring our forces down, there is a certain point – I’m not suggesting we’re there yet – but there is a certain point that countries like China, for example, can say, “Wait a minute. There’s now not that much difference between where Russia and the United States are and where we are, and therefore if we just build ours up somewhat we can be at virtual parity with Russia and the United States.” And voila, instead of having two nuclear powers with a large number of nuclear warheads, you have three. So there is an incentive for countries like that to build up once we go down to a certain point. This is often called the “sprint to parity” argument. While Senator Kyl says that we aren’t yet at a point where this is a concern, the fact that he raised this argument in the context of New START may leave the impression that the U.S./Russian arsenals and the Chinese arsenal are close enough in size that (a) China would consider such a “sprint” and (b) that China has the capability to quickly reach “virtual parity” if it decided to. But neither is true. Here are the facts. Once New START is implemented, the U.S. and Russia would each have about 1,550 deployed strategic nuclear warheads, and several thousand more in storage. In addition, both countries have shorter-range tactical weapons that are not covered by New START. In contrast, China currently has roughly 50 long-range missiles armed with a single warhead that could reach the United States (including Alaska and Hawaii). It currently doesn’t deploy any missiles on submarines, and is not believed to have long-range nuclear-capable bombers. So it currently has fewer than 50 nuclear warheads that could reach the United States. China is thought to have built a total of perhaps 200 to 300 warheads, about 100 of which are deployed on shorter range missiles. Experts believe the number of additional warheads it could build is limited by its small stock of plutonium for weapons – and it is currently not producing more plutonium. Recent reports suggest China may increase the number of warheads deployed on long-range missiles from 50 to maybe 100 by 2021, when New START would expire. 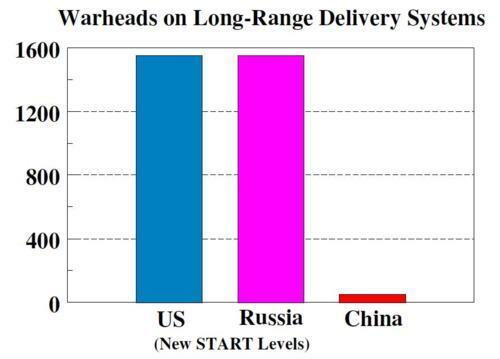 Under New START, the United States will have more than 15 times as many deployed warheads on long-range delivery vehicles. So even if China felt an incentive to “sprint to parity,” it would not have the ability either to sprint or to quickly reach parity with the United States until the U.S. arsenal became much, much smaller than called for by New START. A Chinese buildup would take time and would have visible signs the U.S. would see, and the U.S. would have plenty of time to respond. Raising this issue in the context of New START is a red herring.